This catering terms and conditions document is suitable for any professional caterer – whether one single individual or a large company. It is an essential document because it includes strict paragraphs on the provision of insurance and consequent acceptance of full liability. It is a flexible document, appropriate as a standard “terms and conditions”. It includes a wide number of variables for you to choose to suit your needs. All it requires is a quotation, by reference providing all the information particular to the contract in hand. This document can be used either as the basis for negotiation (to be signed by the parties) or as a "terms and conditions" document when it will be put to a client on a "take-it-or-leave-it" basis before the contract is concluded. Do not risk your clients blaming you for matters beyond your control or as a result of a misunderstanding. 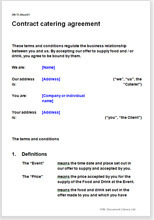 Get the contract terms in writing and your work will progress smoothly.